For the most part, we use puffy paint to embellish every day objects to make them extra special, (As shown in my previous post). But what if you could use the paint... to create the object itself? I've seen the techniques of painting on wax paper over top of printed out clip art objects like leaves and pumpkins. If you string yarn to it, it can be worn. That's cute and kitschy, but what about an upscale looking accessory that you can actually pair with an outfit that doesn't necessarily look like homemade puffy paint craft jewelry? I'll show you how to make this golden glitter cuff bracelet, plus a bonus project: a girl's no-sew headband! Materials: Gold glitter (or your choice of color) puffy paint, ribbon for tie closure, hot glue. Here's how: I printed out an image of a lace ribbon pattern then overlaid wax paper on top of the image. 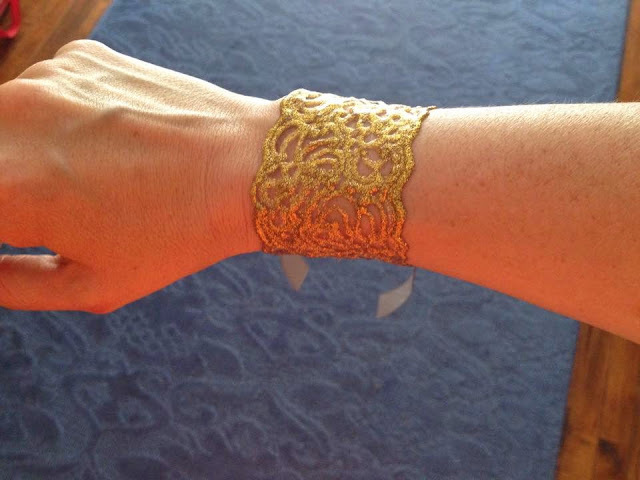 I used gold glitter puffy paint to trace the lace pattern. 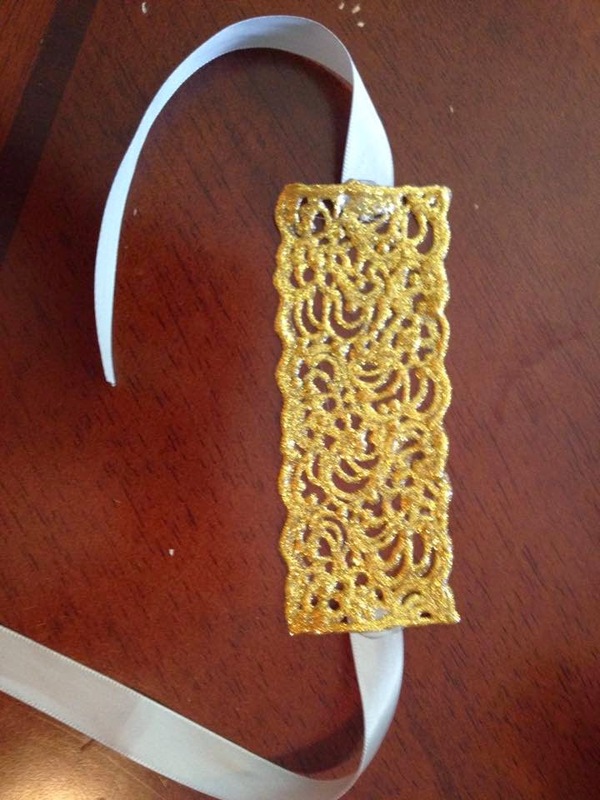 The picture below is a less intricate version of the bracelet above. 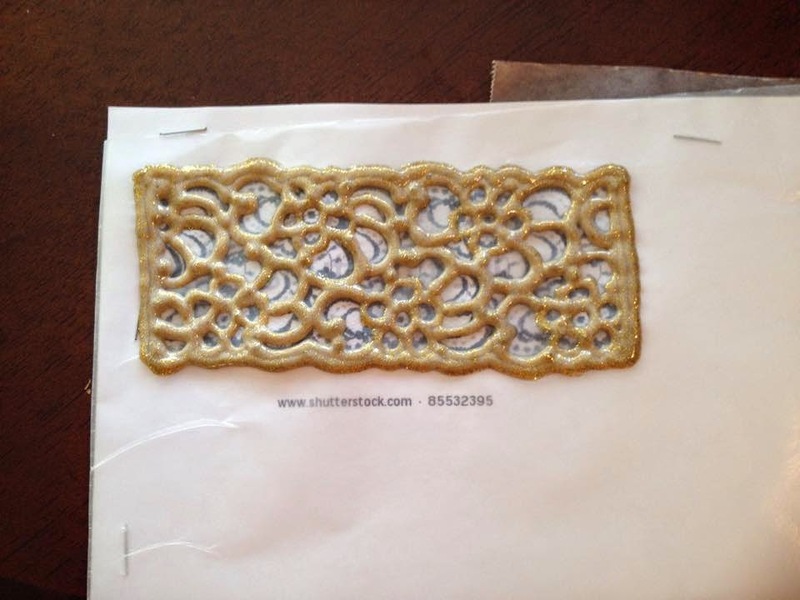 I think it photographs better and more fully illustrates the concept of tracing the lace pattern. This must be left flat and allowed to dry completely and overnight. After drying, gently and carefully peel the wax paper from the paint. I used hot glue to secure a short silvery ribbon to either end. 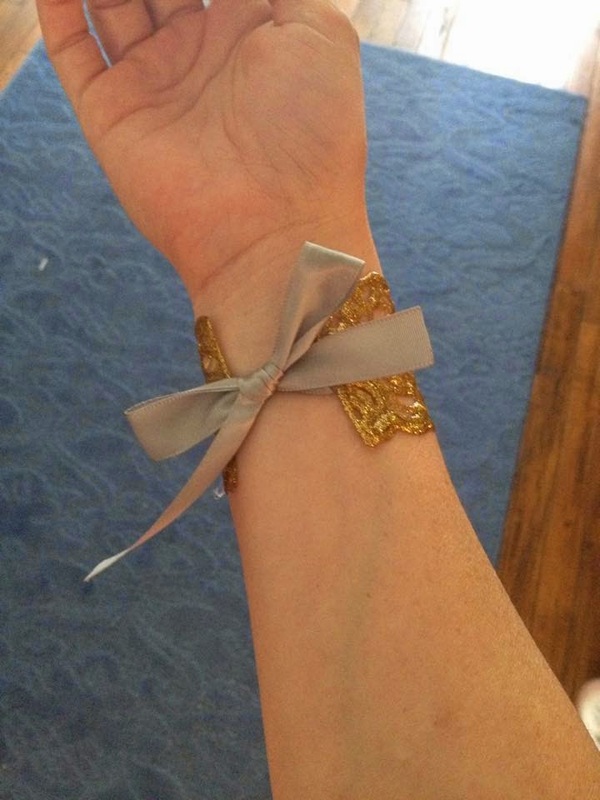 To wear, tie in a bow around the wrist! 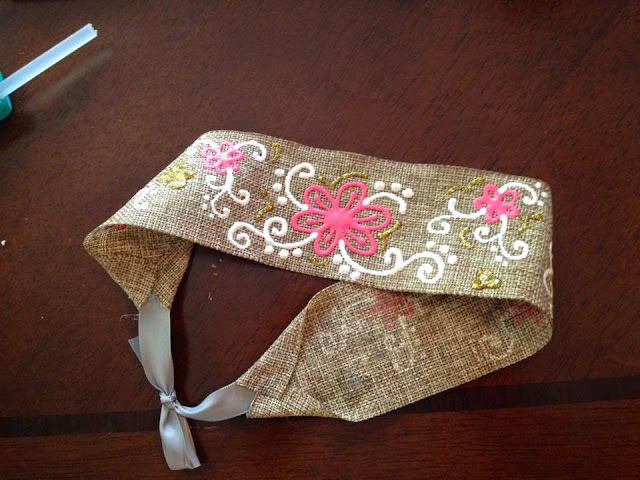 Shabby chic inspired little girl's no-sew headband! Materials: Wide ribbon for headband, narrow ribbon as ties, puffy paint, fabric glue or hot glue. To make: measure from behind one ear to behind the other ear and cut a length of ribbon. Lay the ribbon out on a protected surface. Trace, or free-hand designs onto the ribbon with puffy paint in desired colors. I used burlap lace and pink, white and gold paint. Allow paint to dry over night. Using hot glue or fabric glue, tack the ends of ribbons on to each end of the headband in the center. 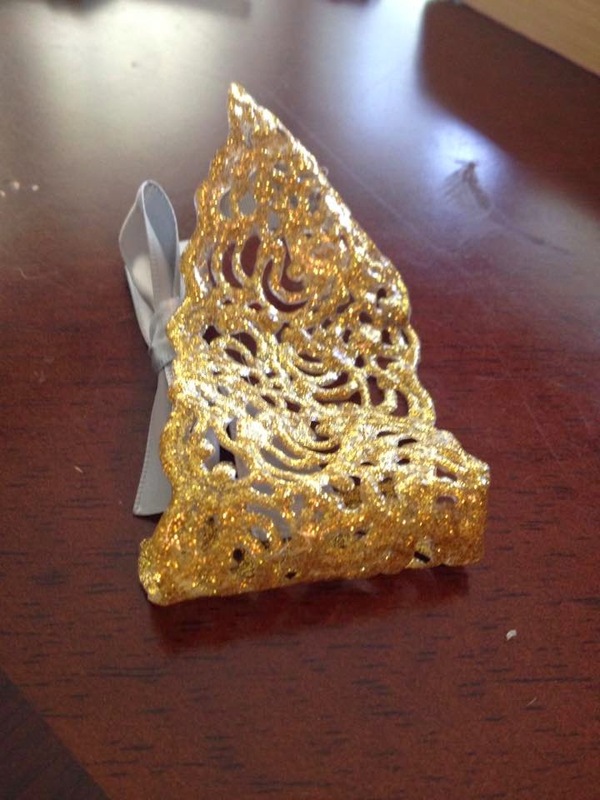 Fold the corners of the headband ribbon over and glue. Be sure to cut the tie ribbons long enough so that you're able to make a bow at the nape of the neck. Leave tie ribbons long or short depending on your desired look. I hope you enjoy these creative ways to use puffy paint!